XGraph v1.1.1.0 : Real time data plotting. Easy to use, Light weight, fast, efficient GDI based function library for graphically plotting real time data. Typical applications include real time usage/performance charts for CPU, HDD, Network etc and to a limited extent, it can also be used for historical charts like Weather, Stock etc. Script      :  XGraph v1.1.1.0 : Real time data plotting. graphically plotting real time data. VarL := "cbSize / hCtrl / hTargetDC / hSourceDC / hSourceBM / hSourcePen / ColumnW / Columns / "
. "MarginL / MarginT / MarginR / MarginB / MX1 / MX2 / BitBltW / BitBltH"
T := "`t",  TT := "`t:`t",  LF := "`n", SP := "                "
Adj := ( Adj := TBMW - MarginL - BitBltW - MarginR ) ? " (-" Adj ")" : ""
VarL := "cbSize / hCtrl / hTargetDC / hSourceDC / hSourceBM / hSourcePen"
hCtrl : Hwnd of Static control. The control's dimension ( W x H ) should be present and exactly match the size of the background bitmap. It is preferable to use a Text control instead of Picture control. Do not use any styles/exstyles or associate a variable with this control. To be specific: The text control should not have a non-client area. hBM : This parameter can be either hBitmap ( BPP 16|24 ) or COLORREF ( eg. 0x0000FF = Red ) that will be used as background. Note: The background bitmap will be applied to the control with STM_SETIMAGE. This means: The graph line may disappear when the timer is not running or the script is paused etc., But whenever window redraws, it draws the background bitmap and there is a guaranteed placeholder. If hBitmap, the dimension ( W x H ) should exactly match the size of the control. The bitmap can be a Grid returned by XGraph_MakeGrid(), or a vertical linear gradient returned by CreateDIB(). A horizontal linear gradient will produce undesirable result whilst plotting. If this parameter is a COLORREF ( eg. 0x0000FF = Red ), XGraph creates a 16BPP bitmap and fills it with COLORREF passed. Default value is 0x000000 and a black bitmap matching control's dimension is automatically created. ColumnW : Column width for each graph line, in pixels. Total columns is derived from this parameter. eg. For a background bitmap width of 600px with no left/right margins and ColumnW of 3, the Total columns will be 600//3 = 200 Columns. Default value is 2 and valid range is from 1 to 255. LTRB : Margin for Left,Top,Right,Bottom. Image transfer will occur from Memory bitmap to screen, only for the derived graph area. A background bitmap can be many times large than the graph area and LTRB allows you to specify the client rectangle where it actually needs to be drawn. PenColor : The line color of graph passed as COLORREF. Default value is 0x808080 and valid range is from 0 to 0xFFFFFF. Note: 24bit color is enforced. PenSize : Thickness of graph line. If 0 is passed, graph line will be short by 1px per column and will result in broken lines. This is a feature. Default value is 1 and valid range is from 0 to 15. Note: GDI lines are not anti-aliased. Line thickness and background color plays an important role in graph's appearance. Pen size of 1 or 2 will be ideal in most situations. SV : Pass True to enable "Set Value" feature. Allocates space for internal array. 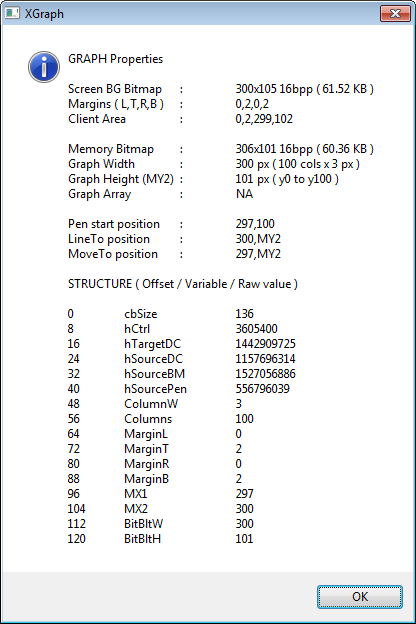 When SV is true, XGraph allocates memory space of 8 bytes ( data type = double ) for each column of graph. Enabling internal array allows you to store/retrieve values with XGraph_Plot(), XGraph_SetVal(), XGraph_GetVal() and XGraph_GetMean(). For a graph with 30 columns, when 31st value is passed, the first value will move out of the graph. When called with single parameter, XGraph_Plot( pGraph ) will update screen without any actual plotting. pGraph : Pointer to Graph data. MY2 : The Y axis coordinate. Pass a null value if you want to refresh/redraw the graph ( Draw should be True ). SetVal : A Column value to store. Updates internal array on FIFO basis. Value will be ignored if MY2 is NULL. Value will be ignored if internal array was not enabled when graph was created with XGraph(). Draw : Transfers the graph from memory to screen. For historical graphs, you can pass False until all columns have been plotted and then call XGraph_Plot( pGraph ) to update the screen. Passing invalid pointer to XGraph_Plot() etc, will result in appcrash. When successful, XGraph_Detach() returns 0, so it is advised to store the return value from this function to pGraph itself. Note: Internal array should have been enabled when creating with XGraph(). Column : Valid column number in graph. When invalid column number is passed, the value for the last column will be returned. Suggested usage: Assign a subroutine [ GoSub Label ) to text control and from the subroutine call XGraph_GetVal() and display the return value in Status bar. Well, one would be tempted to use ToolTip, but it will trigger WM_PAINT() which will erase the graph line. The workaround is to call XGraph_Plot( pGraph ) every time WM_PAINT() is triggered. Column : Valid column number in graph. Invalid number will set the value for last column. ErrorLevel will contain the number of columns used for mean calculation. TailCols : Number of columns ( at the tail of internal array ). GLClr : Color of grid line. Note: 24bit color is enforced. BMPW : ByRef. Width of Bitmap. BMPH : ByRef. Height of Bitmap. If this parameter is NULL, the function returns graph properties. 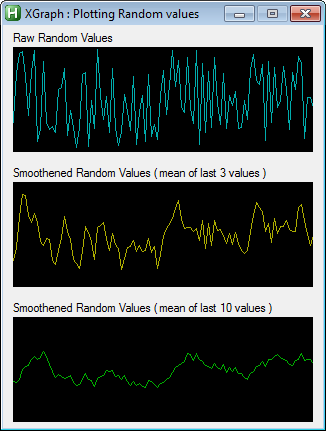 Re: XGraph v1.1.1.0 : Real time data plotting. WOW! THIS IS WAY COOL! I HAVE TO TRY THIS! Killer -- in the meaning of "looks promising"**2.
i guess this script could be also used to generate charts, too? i mean static charts like in Excel (with labels and all)? any examples of such charts? Learning one wrote: Nice library SKAN! GDI is very limited. Excel kind of charts requires GDI Plus. Learning one's Lib looks great . XGraph was specifically written to plot real time data at high speeds with bare minimum resources. When you move your mouse cursor fast enough, it can use 100% of CPU for 1ms which will not be caught by a CPU load monitor running with 1000ms timer as 100% usage for 1ms translates to 0.001% usage for 1000ms. Windows Task Manager's fastest speed is like 250ms. Any faster, the chart would peak as Task manager itself uses lot of CPU time. You can call XGraph_Plot() several thousands of times without registering 1 second of CPU time... But of course, what you plot does matter. GetSystemTimes() does not use much CPU whereas 'Random' command does. If not anything else, XGraph() can be a good performance testing tool. I actually wrote it to monitor the performance of my Mobile dial-up connection ( EDGE ) which is as erratic as Random plotting. Update: Added new function XGraph_GetMean(). This function can return the average value for X number of columns from the end of internal array. Here follows a demo that shows how to combine XGraph_SetVal() and XGraph_GetMean() to smoothen graph line. I wonder about data points? dots on the line for each data point? GDI is fast and efficient for a moving graph.. But since there is no anti-aliasing in GDI, I guess dots would not look good on the graph. Could this maybe be repurposed for a regular chart? 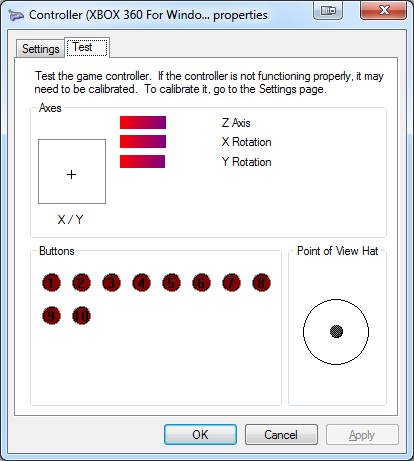 I would like to create something like the windows joystick test dialog using AHK. 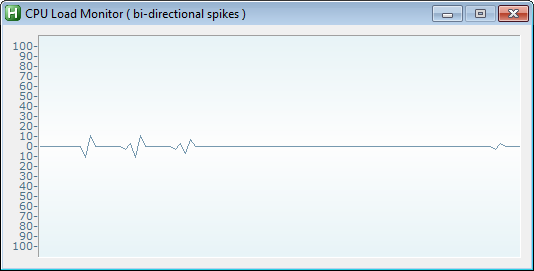 ie, replicate the functionality of the moving "+" in the X/Y chart. This dialog does not update when it does not have focus, whereas AHK does. I would like to make a tool for YouTubers that generates graphics to represent state of keyboard / mouse / joystick, for tutorial videos etc. Thank you so much for posting this! I will be using this library extensively in my future projects. Are there any plans to support resizing of the graph after it has been created? Currently resizing the text control resizes the background but does not scale the actual graph region. Last edited by colt on 15 Jul 2015, 00:18, edited 1 time in total. Can this script allow multiple lines of real time data on the same graph. If so, how? I only see an implementation where one data group per plot. I'm still looking through your code but not sure how it would come together to generate multiple plots on a single graph. like "architech1906" I tried to use it with multiple graphs using the same axis, but for me it seems at the moment it is not possible. Really great lib, SKAN... thank you for sharing! any idea how to implement an filled area underneath the dataplot, with different (fading) colors and transparency for the negative values? It would incredibly increase the readability from a far distance if you've to monitor different machines at the same time by showing each plot. nice Job what you did there! can you maybe add to the lib a way to Change the Graph-Color during the Graph is ploting? maybe you can hit me up with a way to get this! I am finding at high DPI settings, the pen becomes quite badly aliased, which seems to be due to Windows' crappy raster upscaling. Increasing the pen thickness to 2 helps a bit, but it's still a bit nasty to look at, and I would like a nice anti-aliased smooth pen. It seems it's possible to create a custom pen pattern with an antialised style, eg. adding some darker pixels around the center of the pen in a circular pattern. We could instead use ExtCreatePen. According to this, we first need to create a brush containing the pattern (which comes from a bitmap, eg. a .bmp file on disk) and pass the brush's handle to the ExtCreatePen function. This should create the pen with the custom brush pattern. However I'm totally bamboozled by the ExtCreatePen function, as it requires all these data structures which I don't know how to create or even reference. For example I don't even know how to even get the hex code for basic parameters like eg. PS_SOLID := 0 - how did SKAN figure out PS_SOLID = 0? Are there some tools which can discover this? Also how do you discover what byte offsets to use in structures and arrays? Last edited by pneumatic on 07 Oct 2018, 20:55, edited 1 time in total. pneumatic wrote: For example I don't even know how to even get the hex code for basic parameters like eg. PS_SOLID := 0 - how did SKAN figure out PS_SOLID = 0? Uppercase names, like PS_SOLID, are constants in C++. If you look at the requirements section of this page, it tells you in which header the constants are defined. In this case, wingdi.h (include Windows.h). To get the windows header install Visual Studio Community with "Desktop development with C++" checked. Then to find where the constant is defined, create a new Visual C++ - Windows Console Application, then in ConsoleApplication1.cpp, in the include section type "#include <wingdi.h>" or "#include <windows.h>", then in main section type PS_SOLID on a new line. After that, right click PS_TOOLS and click "Go To Definition". And you're done . In the meantime I found it helps reduce visibility of aliasing if I change the pen colour to be closer to the graph's background colour. eg. instead of doing a black pen on a white background, I made it a grey pen eg. RGB (152,152,152). Another possibility might be to do the antialiasing manually in the Plot() function, eg. for each point that you plot, also plot a darker/lighter version of that point above and below. It seems GDI+ supports antialiasing, but GDI doesn't (XGraph uses regular GDI). But here are some articles which show how it's possible to implement antialiasing manually in GDI.